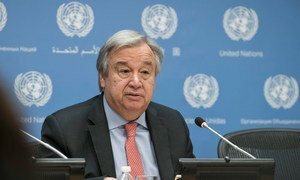 “A global tragedy has hit close to home, and the United Nations is united in grief,” he said, extending his “deepest condolences” to the relatives and loved ones of all those who died. “Let us honour the memory of our colleagues, by keeping their spirit of service alive,” he concluded, before a minute of silence was observed. The United Nations flag flies at half-mast at UN Headquarters in New York in memory of the people who died in an Ethiopian Airlines crash accident in Ethiopia on 10 March 2019. The President of the General Assembly, Maria Fernanda Espinosa, reacting on Twitter on Monday, passed on “heartfelt thoughts” to all friends and families of the victims. “This is a popular route for many fighting for the good of Africa,” she added. "My heartfelt thoughts are with the friends and families of those affected by the devastating crash." In Nairobi, where Ethiopian Airlines flight 302 was bound, UN Office in Nairobi (UNON) Acting-Director General, Maimunah Mohd Sharif, spoke of her “great sadness and shock”. The top UNON official wrote that staff had held a moment of silence in the Kenyan capital on Monday morning to remember “our colleagues and friends” who had died. According to figures released by the airline, citizens from more than 35 nationalities were involved in the accident, which involved a Boeing 737 airliner bound for the Kenyan capital, Nairobi. Kenya reportely suffered the heaviest loss, with 32 nationals on board the plane, followed by 18 Canadians and nine Ethiopians. On Monday as Ethiopia observed a day of national mourning, investigators announced that they had recovered the aircraft’s black box. The fatal crash marks the second time that a new Boeing 737 Max-8 plane has gone down in five months, the first being off the coast of Indonesia, last October. China’s airline regulator announced on Monday that it was grounding its entire fleet of more than 90 Max 8s, according to news reports. After taking off at 8:44am local time on Sunday, the jet lost contact with air traffic control at Bole International Airport in Addis Ababa, crashing six minutes into its flight, news reports say. Extending his sympathies to the victims’ families and friends, Mr Møller said that a number of staff counsellors were on their way to Nairobi from different UN organizations in Geneva.